I’m a big fan of garnet and am glad to see that it’s going to be available generally again, even though I’ve spent a fair amount hoarding it. I honestly don’t see why all of the “inks of the year” aren’t made readily available like this. It seems like we may be slowly heading in that direction though that would negate the “limited edition” angle. I’m intrigued by Garnet. It is my birthstone, and I love rich red-colored inks, so I always make it a point to try Garnet inks when I see them. However, I never had a chance to try this one because by the time I was aware of it, it was gone. I only started collecting fountain pens in late 2015. So I am really looking forward to trying this one. Likewise, I feel the same about Amber and Turmaline. Just from pictures I’ve seen of them, they look like gorgeous colors. I wish Pelikan would just quit teasing us and bring them all back, right now. (But then, I’ve never been known for patience when it comes to pens and inks.) I was lucky enough to buy one precious bottle of Amethyst. Initially, I wasn’t too interested in it; it seemed too dark. However, the beautiful but subtle violet shading kept begging second and third looks, and it grew on me. I don’t look forward to running out; it’s unique, and probably impossible to duplicate. I don’t think I’m alone in wanting Pelikan to bring that one back. 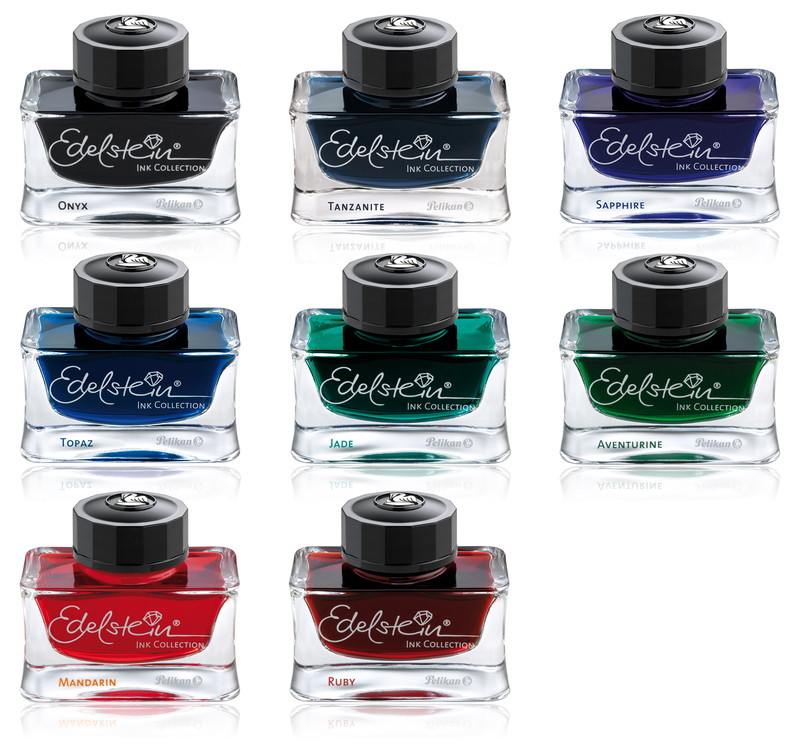 I’ve decided that unless I just dislike a certain color, I’ll eventually (before it’s too late) expand my collection of Edelstein inks to include at least one of every color available to me. All I can do is hope that they bring back the colors I never had a chance to try. Garnet seems to have have been a little hot and cold if you look at the original reviews. I never found it that dark or rich but it’s certainly a very serviceable shade. Hope you’re able to pick one up. I really like Garnet and am glad to see it readily available again. But, I would prefer to Amber first, since that is the only one I was never able to get. 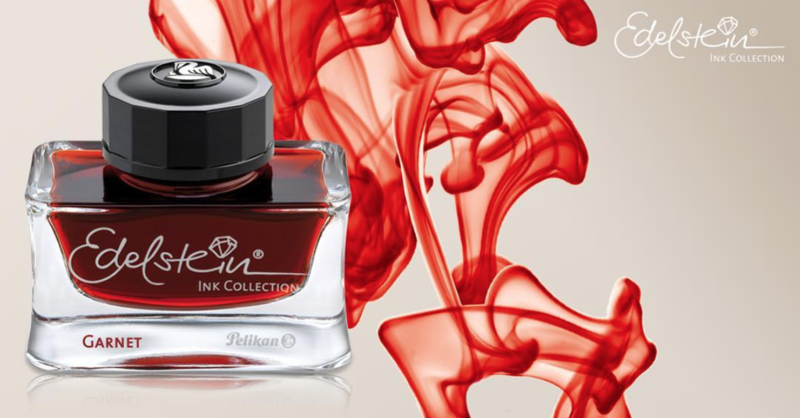 On the other hand, I don’t understand Pelikan’s strategy of releasing the inks of the year as LE and then bringing them back. It just defeats the purpose and creates confusion (do I buy immediately to guarantee that I’ll get it? Or, shouldn’t I worry (since it will eventually be brought into the regular line)? It would be better if they just released them as permanent additions to the regular line. I ran a poll last year and it seemed that Amethyst was the most desired of the ones people wanted to see brought back with Amber as a very close second. I was quite surprised when the brought Aquamarine back last year since it was so fresh. An older ink like Garnet makes sense but I would definitely have chosen some of the more popular colors. I was very lucky to score a bottle of Amber and it wasn’t easy to come by. Worth it though. I agree about the confusion and mixed messaging. I’m so glad it’s back! Amber was way too light for me. Amethyst was nice. I’m not really into blue inks (though it is one of my favorite colors) so I can take or leave Aquamarine. Haven’t yet tried Olivine, but Smoky Quartz is one of my favorite inks. I think you’ll like Olivine from what I can glean from your statements. Amber looks nice in bigger nibs. It’s one of the few yellow hued inks that I own. Interestingly, in 1/2018 when we checked into the Sheraton Pelikan in Hanover Germany (built in the original pen factory), our welcome gift at check-in was a few tins of Garnet cartridges. We see now that either they were leftovers (Olivine hadn’t been announced yet) or a tip-off to the color’s elevated status. I would suspect old stock but surprising they would still have Garnet 4 years later. Nice coincidence though and I’m still very jealous of your trip. I’m a sucker for dark red inks (I’m looking at you, Red Dragon, Oxblood, Syrah, Black Swan in English Roses, & Ottoman Rose! ), so Garnet looks like a possibility. I’m not sure that you would find it as dark as some of the other inks you mention in that category. Still, worth looking into. I like the dark red inks too but don’t have much occasion to write with them. If I was a teacher, I’d be all over them. I agree with all the comments about Pelikan’s irritating practice of not making popular inks permanently available. If an ink of the year sells well, (as I believe Amethyst did) then surely it would be easy for Pelikan to accommodate its customers by making these colours permanent. As a result, I have had to create a hoard of Amethyst and Smoky Quartz, both of which are large enough to guarantee I won’t run out for at least a decade! Let’s hope the inclusion of Garnet in the permanently available list means that Pelikan will expand this to other colours. I think that your point about the limited availability of cartridges in some colors is well taken. All of the machinery is in place for this already so it is unclear to me why they would not pursue this for every color. It would be better if they would just add the IOTY to the permanent collection as they are released rather than play this game of “faux” limited availability. It feels like a ploy to generate sales. I do hope that they will bring Amber and Amethyst back in the future. Only time will tell. I have a M800 with Edelstien Tanzanite ink in it and it works well for me. However, in my M1000 I am using Pilot Iroshizuku Kon-peki which I like. Any thoughts on other inks? I was thinking of trying out Diamine Autumn Gold or Imperial Purple in a Pelikan M600 I have. 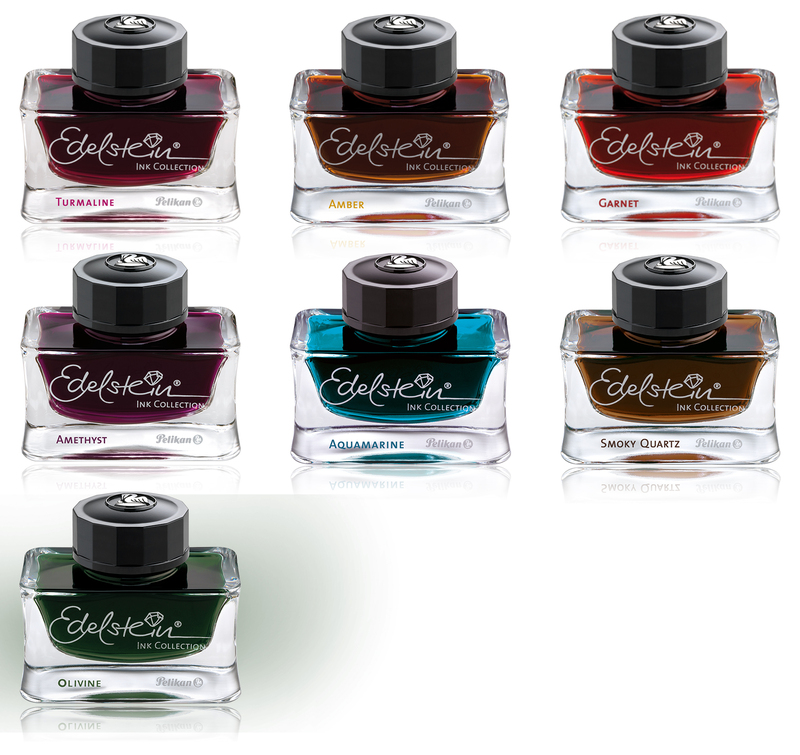 Does anyone know the pHs of the Edelstain inks? I did contact Pelikan on that but they were not very forthcoming – the customer care person did not seem to know or was unable to supply information. Tanzanite and Kon-Peki are two of my favorites. I stick to Pelikan’s 4001 and Edelstein lines, Waterman, Aurora, and Iroshizuku. I’m not too adventurous outside of those lines. I don’t have much experience with Diamine so I can’t comment on that one. I have not seen the pH of Edelstein inks reported anywhere. I did once see some 4001 colors pegged with a pH of 2.7. I don’t have any ability to independently verify that though. You can read more about that here.